An oil tanker is still burning Tuesday after a collision with a freighter off the coast of China Saturday night. 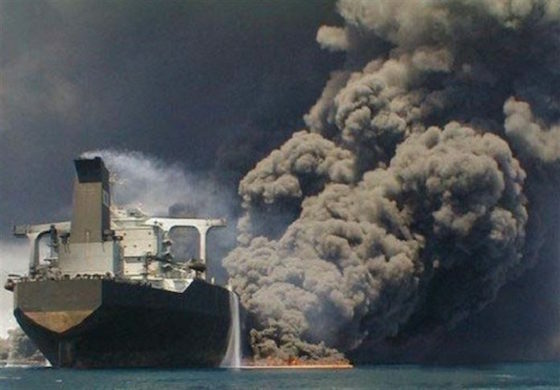 A tanker carrying Iranian oil that collided with a Chinese freight ship in the East China Sea Saturday night was still on fire Tuesday morning, the Chinese government said, as dozens of rescue boats struggled to control the blaze for a third day. Poor conditions, with heavy winds, rain and high waves, continue to hamper efforts to tame the fire and search for the 31 remaining crew members on the tanker, the Ministry of Transport said. Concerns continue to mount the tanker may explode and sink while a flotilla of 13 search and rescue vessels comb a 900-square-nautical-mile area around the ship for the crew. The tanker hit a freight ship on Saturday night in the East China Sea and burst into flames after spilling oil. The tanker Sanchi, run by Iran’s top oil shipping operator, National Iranian Tanker, collided with the CF Crystal, carrying grain from the United States, about 160 nautical miles off China’s coast near Shanghai and the mouth of the Yangtze River Delta. The Sanchi was carrying 136,000 metric tons of condensate, an ultra-light crude oil that becomes highly volatile when exposed to air and water, to South Korea. The size of the oil spill from the ship and the extent of the environmental harm were not known, but the disaster has the potential to be the worst since 1991 when 260,000 metric tons of oil leaked off the Angolan coast.